Everyone knows about the iconic Christ the Redeemer statue in Rio de Janeiro, Brazil, but there are actually a number of dramatic statues depicting Jesus Christ around the world. Christ the King in Poland wears a gilded crown. Vietnam’s Christ of Vũng Tàu overlooks the ocean. In Nigeria, Jesus de Greatest is carved from white marble and is the largest statue of Jesus on the continent of Africa. 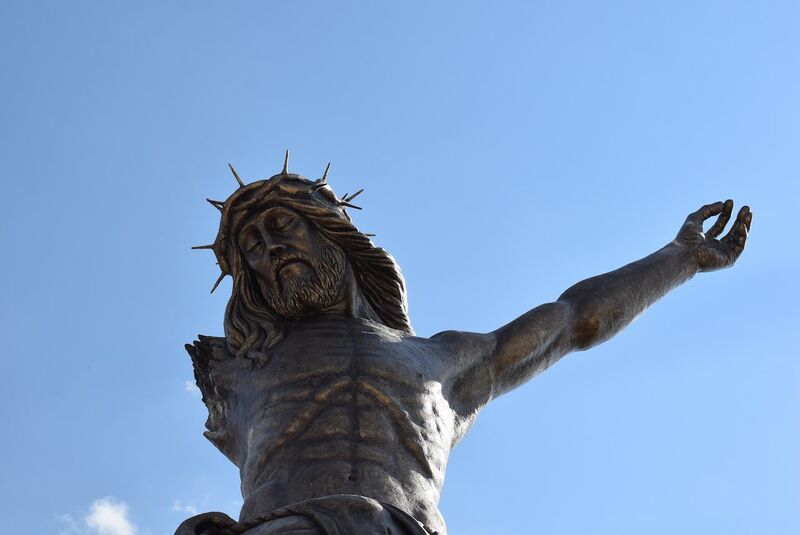 In honor of Easter, we’ve rounded up some of the coolest Jesus statues around the world, be they underwater or on top of a hill. Snorkel the warm, clear waters of the vibrant sea garden that is John Pennekamp Coral Reef State Park and you may come across a surprising sight: a large statue of Jesus 25 feet underwater. 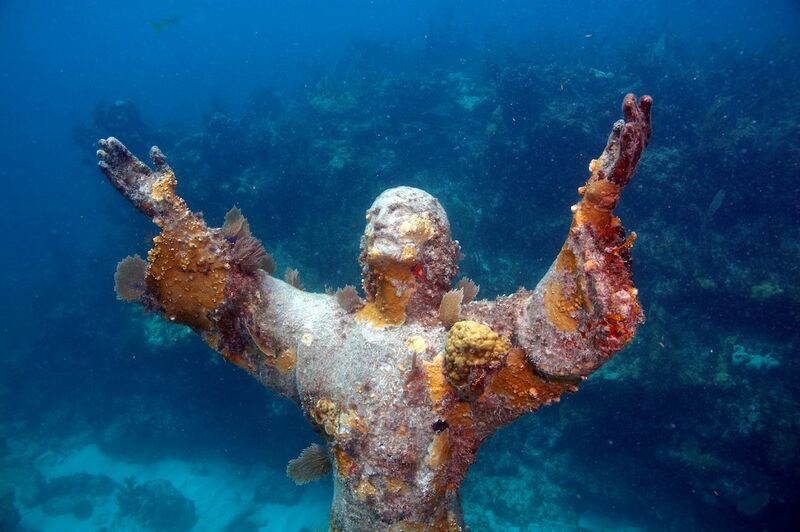 Christ of the Abyss is located off the coast of Key Largo in the Florida Keys and is one of the most famous dive sites in the world. His hands are raised toward the heavens in a show of peace, and if you can hold your breath long enough, you’ll find a plaque at the base that reads, “If I take the wings of the morning / And swell in the uttermost parts of the sea, / Even there your hand will lead me / and your right hand hold me fast” (Psalm 139:9). There are two more identical statues elsewhere in the world: The original one is in the Mediterranean Sea near Italy, and there’s another off the coast of Grenada in the Caribbean. This oddly posed statue of Jesus, located on the outskirts of Palencia in Spain, has a somber, almost morose, expression on his face. Standing nearly 70 feet tall, his posture suggests that he is there to overlook and bless the city below. There is a small chapel and museum at the feet of the statue that contain items by the architect, Victorio Macho, who is also buried there. Located at nondenominational Solid Rock Church in Ohio, Lux Mundi (Latin for “light of the world”) was designed by artist Tom Tsuchiya to replace a statue called King of Kings after a lightning strike destroyed it in 2010. 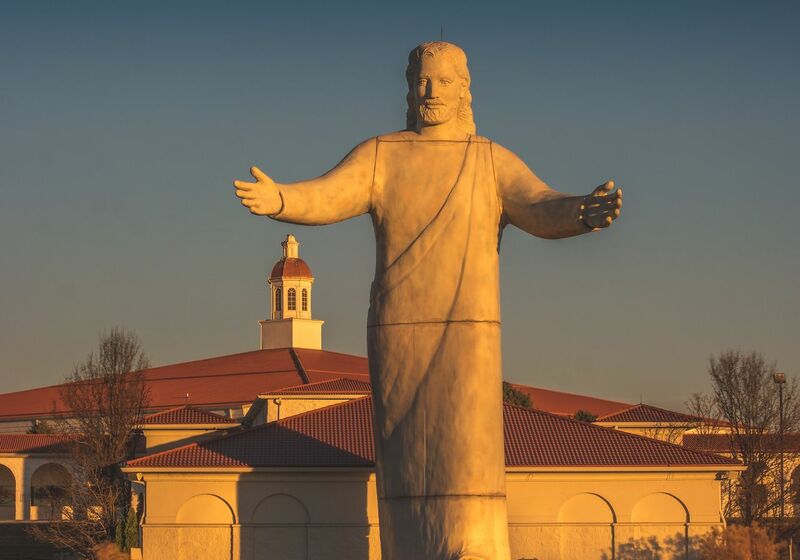 The welcoming gesture of the new statue was inspired by the Gospels of Matthew and John in the Bible; in fact, the statue looks so friendly that some have nicknamed it “Hug Me Jesus.” The original statue was a bit more dramatic in posture; Jesus was depicted only from the chest up, with arms outstretched toward heaven and a large cross at the base. Both statues are surrounded by fountains at the church’s baptismal pool. Mexico’s Broken Christ of The Island Shrine stands over 80 feet tall in the middle of the Presidente Calles Dam, located in the small town of San José de Gracia. Legend has it that an image of a broken Christ arrived in the town mysteriously. The recipient was going to repair it, but a voice spoke to him in the night and told him to leave it broken as a reminder for his brothers and sisters who also were limited or otherwise oppressed. Visitors can take a ferry or boat ride to the island to see the statue. 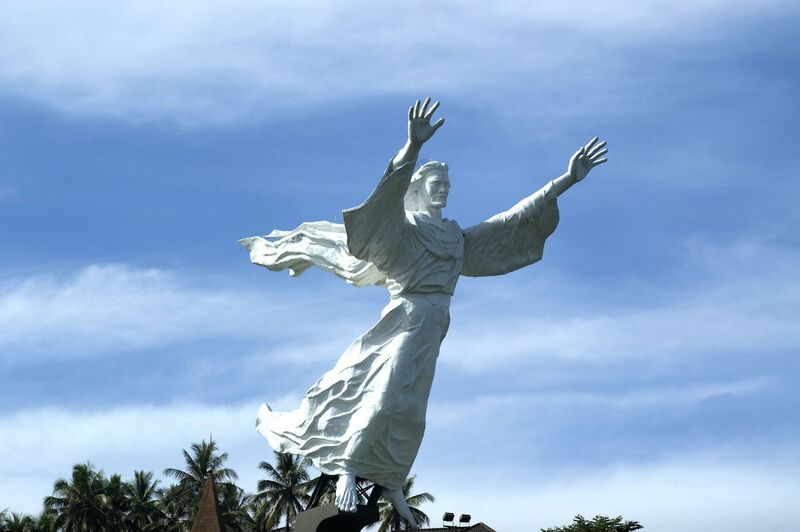 The large, nearly 100-foot statue of “Christ blessing” the people of Manado City, Indonesia, is the world’s fourth tallest statue of Jesus. 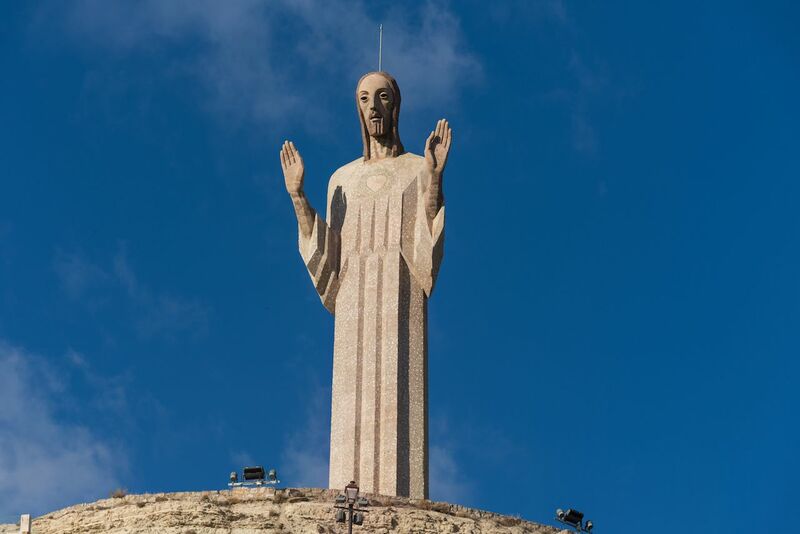 Constructed of soapstone, the statue is situated on top of a hill and almost appears as if Jesus is flying. It has become a must-see on any trip to Manado City; in fact, the surrounding city is so small that you can supposedly see the statue from anywhere in it, so it serves as a great reference point for visitors. Unfortunately, because it’s located inside a residential community and therefore surrounded by private homes, you cannot go to the base of the statue, but you can go to an area across from the statue to pose with it in the distance, which some say is a better angle for photos anyway. 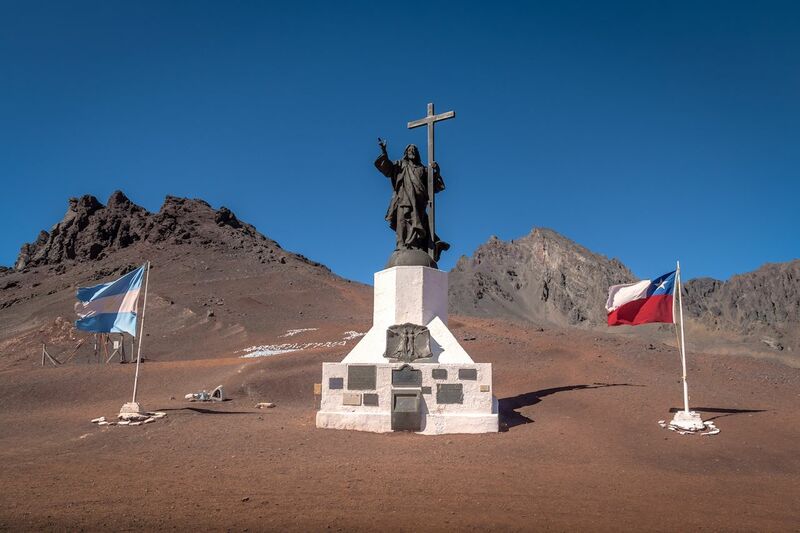 Located high up in the Andes mountain range — over 12,000 feet above sea level — Christ the Redeemer of the Andes straddles the border of Chile and Argentina. It was built in 1904 as a symbol of peace to mark the resolution of the two countries’ border dispute in 1902 after they narrowly avoided going to war. Accordingly, this depiction of Jesus stands on a globe (with South America displayed prominently). His right hand is raised in blessing while his left hand holds a cross. Hopeful visitors can arrive via dirt road, but the path is precarious with numerous switchbacks and hairpin turns as well as steep cliffs, so the road is not open during the snowy winter months. 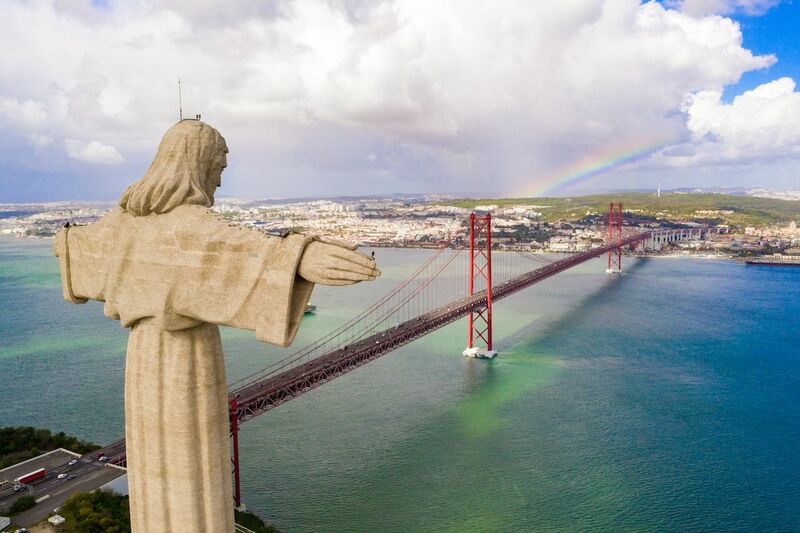 Inspired by the Christ the Redeemer statue in Rio de Janeiro, Portugal’s Christ the King statue depicts Jesus with arms raised to bless the city; the statue overlooks Lisbon but is located in nearby Almada. It was built in the 1950s as a show of reverence after Portugal managed to avoid the destruction and carnage of World War II. Built on a tall base, the statue offers a viewing platform at the foot of the actual statue of Jesus, and it’s over 250 feet high. Visitors take an easy ferry ride and bus to get to the monument, which is built among a large complex with gardens, pilgrimage buildings, a chapel, and a café. The grounds, open every day, are free to visit, but the elevator to ascend to the viewing platforms costs a few dollars.